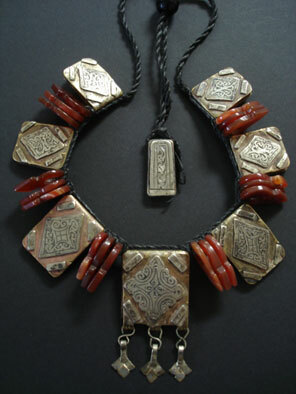 Seven copper & silver Berber talisman prayer boxes representing the seven days of the week and also used for inserting verse and prayers with African carnelian Talhakimts used as spacers makes an incredibly interesting necklace. The necklace is strung on waxed handwoven cotton which allows the length to be adjusted and has a smaller silver amulet that lies at the back of the neck. A beauty!